Being fearless in battle was important, but shuffling bravely off the mortal coil mattered more. Here are two take-aways from Tom Shippey’s latest book: One, “Viking” was a job description, not a racial or ethnic designation; and two, a quality demanded of those Vikings was a finely honed, mordant sense of humor that perhaps we modern nine-to-five cubicle-dwellers would find difficult to understand. That sense of humor includes composing, on the spot, even as the composer is being bitten to death by a pit-full of adders, a beautiful song that will be handed down through the ages. 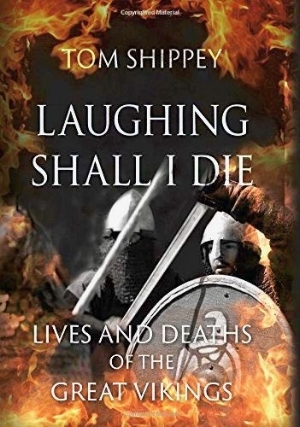 The song concludes with the line, “Laughing shall I die,” primarily because the dying Viking knows his sons are coming to wreak vengeance on the king who put him in the pit and will subject said king to a longer, slower, far grislier demise. It’s pretty funny, apparently, if you’re a Viking. For the rest of us, it’s funny because the death song’s composer is named Ragnar Hairy-breeches, and one of his avenging sons is named Ivar the Boneless. It turns out, though, that while Ragnar may be mostly the stuff of myth and legend, Ivar is not only an historical figure, he is a significant one. As for the “Boneless” part, no one is quite sure of the nickname’s origin, but one theory is that he was being compared to a serpent — which to the Vikings meant a dragon — so it’s actually a compliment. The author’s stated purpose in this book is to explore what gave Vikings their edge, when they had fewer people and resources than most of the populations they came up against, as they swept across Britain and mainland Europe into Russia and the Middle East over a distinct 300-year period. He argues that their edge was “the Viking mindset. To put it bluntly, it’s a kind of death cult.” Their disdain of death made them hard to beat on and off the field of battle. Shippey also notes that his book is meant for “the reading public.” What’s interesting, then, is that Shippey appears to be using his general lay reader — who should be forgiven for not being up on the latest battles within the learned academia of Viking lore — to engage in an argument with scholars on the other side of the divide (one of whom is his former tutor). The effect is a bit like stopping by a friend’s house and finding yourself used as a go-between in an argument you’ve blundered into (“Could you tell him that?” “Oh, yeah? Well, maybe she should know…”), when you all you wanted was some wine. To summarize his side of the spat, Shippey believes that modern academia finds its delicate sensibilities affronted by the less culturally refined aspects of the marauding Vikings, and has worked to ignore, bowdlerize, explain away, and generally discount what it sees as a cartoon version of the Viking ethos. These academics compare Viking legend with the overblown mythology of America’s Wild West. Shippey works to dismantle that view. To do so, he draws heavily upon the great sagas, from which we derive much of our knowledge of the ancient Norse traditions, culture, and religion. Many of those sagas are thought to be far older than the Viking period itself, which is dated to 793, the point at which the outside world became aware of the pillaging Norseman — vikingr, or marauder. Before written language, the sagas and traditions of eddic and skaldic poetry provided exceptionally well-developed oral histories of Scandinavia, embellished, of course, with many supernatural elements. Eventually, those oral histories were written down by Icelanders and then rediscovered by the outside world at the end of the Middle Ages. Part II gives a geographical view of the vast reach of Viking hegemony. Here is where the legends begin to morph into historical reality, and we start to grasp the enormity of Scandinavian influence on the British Isles, the Continent, Russia, and even the Middle East. Among Shippey’s insights are that Vikings made more successful inroads in England than in Ireland because England had an established bureaucratic infrastructure. There, the Vikings simply eliminated a handful of rulers and stepped into the open slots. Ireland was too chaotic to deal with in a similar fashion; there was no operation to take over. Part III describes in detail a few of the great sagas, such as Njal’s Saga, to highlight particular aspects of the Viking mindset. The problem is that setting the context requires a long lead-in, which — much like having to explain a joke — drains the energy from the stories. And therein lies the larger problem: This material begs for a narrative-nonfiction approach, to get blood pumping through the descriptions and perhaps engage the readers’ imaginations more successfully. Though Shippey tries to keep things jaunty with some of his descriptions, many details are too pedantically academic; it feels as though he’s still playing to his old tutor. As it is, Shippey may simply inspire his readers to binge-watch “The Vikings” (both the TV series and movie) so they can see what they’ve been missing. Jennifer Bort Yacovissi’s debut novel, Up the Hill to Home, tells the story of four generations of a family in Washington, D.C. from the Civil War to the Great Depression. Jenny is a member of PEN/America and the National Book Critics’ Circle, and writes a monthly column and reviews regularly for the Washington Independent Review of Books. She is serving as chair of the 2017 and 2018 Washington Writers Conference, and is president of the Annapolis chapter of the Maryland Writers’ Association. Scuttlebutt: The Green new Deal and . . .